Nostalgic baptismal kit for boy. The combination of soft earthy brown and bright light blue colors with the contrast created by the blue rouge on its fabrics give a great emphasis to the whole set. Three wooden carousel and bead hooks are attached to the candle. His towel has tapped the same rocking horse. The set complements a practical handbag bag in all three colors. The set includes: candle, large handbag-bag, three candles, soap, bottle of oil, laurels, underwears and towels. 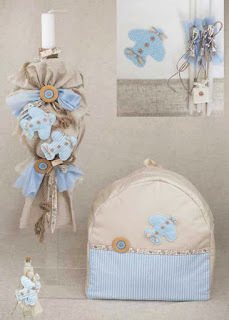 https://www.preciousandpretty.com/2018/07/carousel-christening-set-for-boys-E817.html Greek Wedding Favors|Orthodox Crowns|Stefana|Baptism Invitations Carousel Christening set for boys E817 Christening set for boys, with nice carousel, with rocking horses. Product #: Greek Wedding Favors|Orthodox Crowns|Stefana|Baptism Invitations_6526190824455013348 5 stars out of 5 reviews.